The world economy is facing strong and complex cross currents. On the one hand, major economies are benefiting from the decline in the price of oil. On the other, in many parts of the world, lower long run prospects adversely affect demand, resulting in a strong undertow. We released the World Economic Outlook Update today in Beijing, China. The upshot for the global economy is that while we expect stronger growth in 2015 than in 2014, our forecast is slightly down from last October. More specifically, our forecast for global growth in 2015 is 3.5%, 0.3% higher than global growth in 2014, but 0.3% less than our forecast in October. For 2016, we forecast 3.7% growth, again a downward revision from the last World Economic Outlook. At the country level, the cross currents make for a complicated picture. Good news for oil importers, bad news for exporters. Good news for commodity importers, bad news for exporters. Continuing struggles for the countries which still show scars of the crisis, not so for others. Good news for countries more linked to the euro and the yen, bad news for those more linked to the dollar. In short, many different combinations, many different boxes, and countries in each box. Let me expand a bit on some of these themes. The price of oil has declined from about 100 dollars a barrel in June to less than 50 dollars today. The sudden decline appears largely due to an unexpected change in OPEC strategy, namely the decision to maintain OPEC supply in the face of steadily increasing non OPEC supply and weakening global demand. We expect the factors behind the decrease to remain relevant, and thus much but not all of the price decline to be persistent. For oil importers, this is good news. The price decline increases real income, decreases costs of production for firms, and both lead to more spending. The effect can potentially be large. If, for example, oil consumption is equal to 3% of GDP, a 50% drop reflects an increase in real income of 1.5%, the equivalent of a large fiscal expansion for example. It also leads to lower inflation, which, in other times could be a blessing, but in the current environment of too low inflation and central banks’ policy rates close to zero, is a source of worry. On net however, we have little doubt that, for oil importers, the effect is strongly positive. For oil exporters, and for firms involved in new forms of energy production, this is clearly bad news. To the extent that the price decrease is persistent, oil exporters will have to reduce their level of government spending. Those who have substantial buffers, or those that have flexible exchange rates, can adjust more slowly. Others may need to do more dramatic adjustments. In that context, the adverse effects on Russia and Nigeria are likely to be very large. Some energy firms may also face financial risks. Systemic risks, either from country or corporate defaults, however appear limited. Another important development is the movement in exchange rates. Since August, the dollar has appreciated in real terms by 7%, the euro has depreciated by 3%, and the yen by 10%. While the dollar appreciation may slow down the US recovery, it must be seen as a welcome adjustment. It will boost demand in two large economies, the euro area and Japan, and maybe help them out of their slump. Unfortunately, these positive developments are offset by bad news on a number of fronts. One of the major disappointments of 2014 was the low growth in Japan. Sustained growth in Japan requires two conditions: more private demand in the short run, and higher potential growth in the medium run. Both private domestic and foreign demand have disappointed recently, and the structural reform impetus still seems too weak to raise expectations about future growth and spur investment. More generally, our assessment of the underlying growth potential in many countries has been revised down. Reasons vary. The effects of the decline in commodity prices which started in 2011 on Latin America’s growth prospects are becoming clearer. The same is true of sub Saharan Africa. Russia is suffering from a combination of ills, from uncertainty and a poor investment climate, to sanctions, to lower oil prices. In China, on the other hand, the gradual decrease in growth to below 7% in 2015 reflects a welcome decision to reorient the economy towards consumption and away from the real estate sector and shadow banking. This lower growth however is in turn affecting the rest of Asia. Where does this leave us? Looking at advanced countries, our forecasts reflect the increasing divergence between the United States on the one hand, and the Euro area and Japan on the other. For 2015, we have revised US growth up to 3.6%, Euro area growth down to 1.2%, Japan growth down to 0.6%. Some of our largest downward revisions are in emerging markets, notably in Sub-Saharan Africa, the economies of the Commonwealth of Independent States (CIS), and Latin America. They were smaller in Emerging Asia, where growth is still very high, particularly in its leading economies like India and China. As always, there are risks to the forecasts. The most obvious downside risks involve stagnation in the Euro area and in Japan. In both, using the three arrows (borrowing the expression from Abenomics), monetary policy, fiscal policy, and structural policies, continues to be of the essence. Risks of another episode of turmoil associated with the increase in short rates in the United States are present, but limited. Some corporates in emerging market indebted in dollars could also prove vulnerable to the additional pressures from a strong dollar and weak earnings from low commodity prices. Let me end however on a more positive note. Assessing the favorable effects of the decline in the price of oil in the current environment is difficult. This decline may turn out to be a stronger “shot in the arm” than is implicit in our forecasts. In other words, when we meet again in the spring, our forecasts may turn out to have been a bit too pessimistic. I very much hope so. 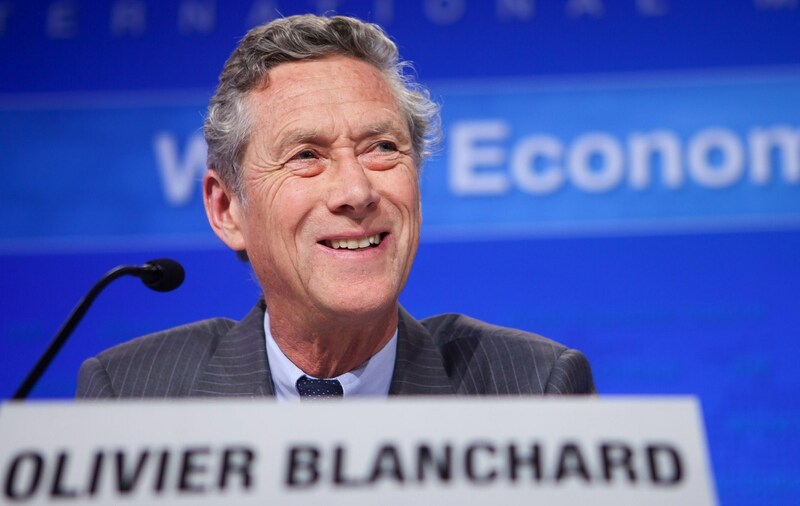 Hear tête-à-tête podcast with Blanchard about the state of the world economy.